Paddling under the full moon is enchanting! The night and sounds add to the ambiance of your surroundings. This three hours program, ninety minutes on the water trip will take you though some of the historical feature on the Oakland Estuary. You'll enjoy a leisurely pace as the sunsets and the moon rises, illuminating a delightful evening. The water is often calm and glassy, and the world appears completely different under the moon beams. Cost: $89/Single Kayak; $149/double kayak, booked for two. Includes kayak, paddling gear, wetsuit optional for this trip. Prerequisite: Paddle Rescue required for single closed deck kayak. No experience necessary for double kayak. A good physical condition is required to assure an enjoyable trip. The minimum age for the class is 10 years paddling with and adult; children under 18 years must be accompanied by a parent or legal guardian. Be able to paddle up to 3+ miles. Sunset kayaking is an enchanting experience. The water often turns glassy and calm on the Oakland Estuary late in the day, and twilight adds to the unique ambiance. 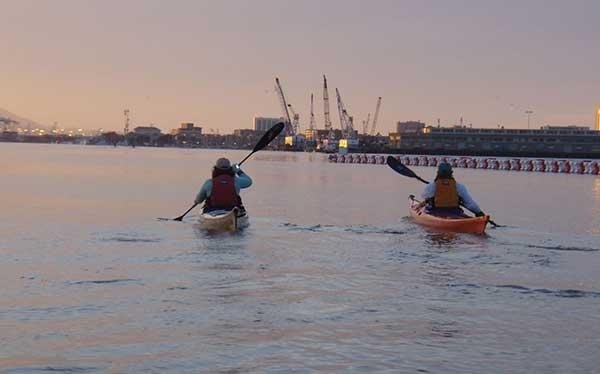 This three hours trips, approximately ninety minutes on the water trip will take you though some of the historical feature on the Oakland Estuary. 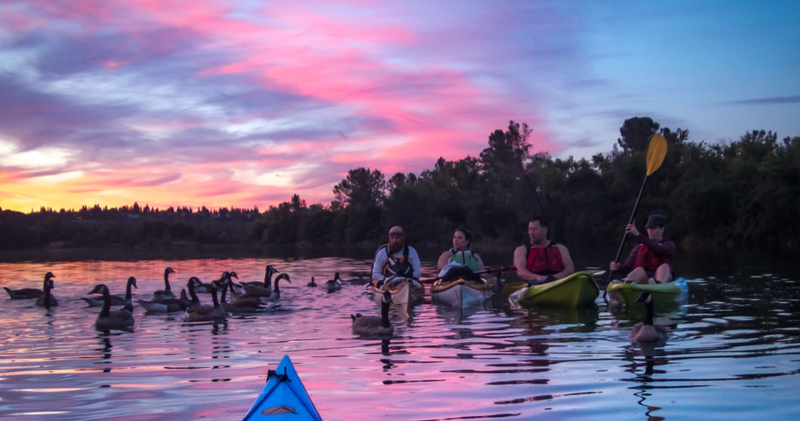 You'll enjoy a leisurely paddling pace as the sun goes down, setting the stage for a beautiful evening on the water. You’ll explore the historic waterfront and WWII maritime history. After the trip step into one of the many local restaurants for food and drinks. Prerequisite: Paddle Rescue required for single closed deck kayak. No experience necessary for double kayak. A good physical condition is required to assure an enjoyable Trip. The minimum age for the class is 10 years paddling with an adult; children under 18 years must be accompanied by a parent or legal guardian. Be able to paddle up to 3+ miles.